I always get quite excited when Bait-Tech launches a new product but for 2016 one product in particular was creating a buzz and, if you’ll excuse the pun, really getting my juices flowing! I first became aware of this rather secretive new liquid through Andy Neal’s excellent match reports and write ups on the Bait-Tech website. He was using it all over the place, on his maggots, bread, corn, putting it in the water to pump his expanders, soaking his micros and probably even dabbing it behind his ears before a big night out!Now obviously Andy is heavily involved with Bait-Tech and you would expect him to be promoting and pushing this new product but they already have a fantastic selection of liquids in their portfolio, including the brilliant Predator Plus and Krill and Tuna, so what’s so special about this one? The early pictures in Andy’s reports of a simple white bottle with ‘The Juice’ written on it in black marker pen just added to the intrigue. Even the description of ‘The Juice’ on the website (below), is rather minimalistic and the air of mystery continues, I had to get hold of some! 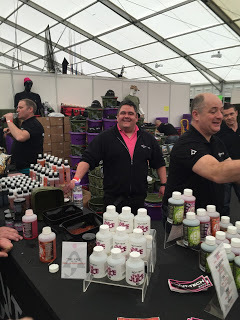 The chance to get my hands on the ‘The Juice’ arrived when I went to The Big One with Steve Hurford and we headed to the very impressive Bait-Tech stand where the lovely MD of Bait-Tech, Hayley, showed me all the new products on display, they all looked and smelt great but if I’m honest I couldn’t really remember too much about them, as all I could focus on were the white bottles I could see further along the stand where Andy Neal stood behind them like a modern day guardian of the Holy Grail (in pink!). Finally we reached them and Hayley took the top off a bottle for me to smell and it has a heavenly sweet smell, I can’t really be more descriptive than that, it doesn’t smell like anything I can readily describe, it’s just very sweet! It’s also colourless and has very thick, syrupy consistency, ideal for coating hookbaits and using as a glug. For my next match, I prepared some 4mm Xpands by adding some of ‘The Juice’ to the water for pumping the pellets. On a rather tough day I managed third place in the silvers with 9lb 3oz of skimmers, roach and tench. 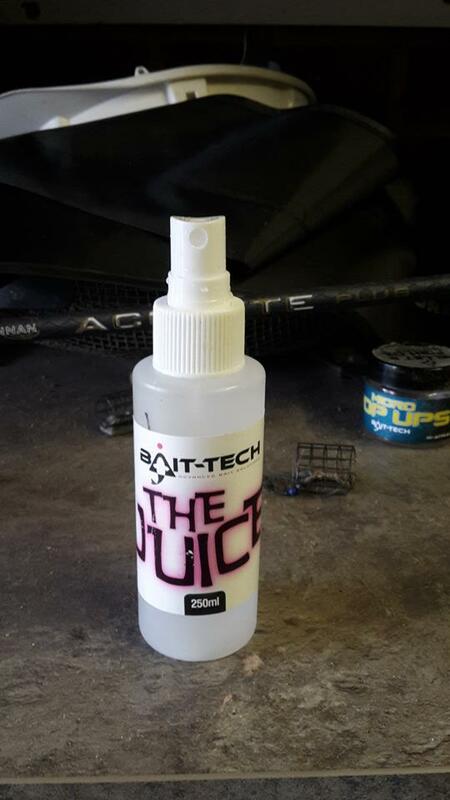 You can read the full report here – The Juice’s first outing for me. Now I would like to report that ever since it’s virgin outing, I’ve been catching loads of fish using ‘The Juice’ and winning money hand over fist but that’s not been the case. I have always strived to be honest and give as fair a review as I can but a succession of bad draws hasn’t helped which just goes to prove that old adage that there’s no such thing as a wonder additive and you won’t catch fish that ain’t there! I have, however, beaten the pegs either side of me in the last three matches and that in itself gives you a confidence boost. I will update this review as and when I’ve tried some different applications for this very versatile additive. I also came across this great little tip from Bait-Tech’s Dean Barlow which I’ll be trying out in the near future. 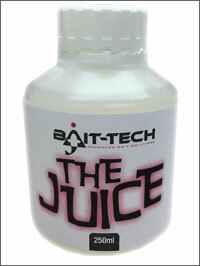 ‘The Juice is playing a big part in my fishing and I needed an easier way to get it on my bait quicker. Whilst in match conditions it’s difficult to leave baits “glugging” while you fish, so I got hold of some mini atomizer sprays to which I add 80% juice and 20% water. A great idea and one I reckon would be a hit if Bait-Tech made it available in the shops!